Summary: This walk includes a poignant reminder of the past. 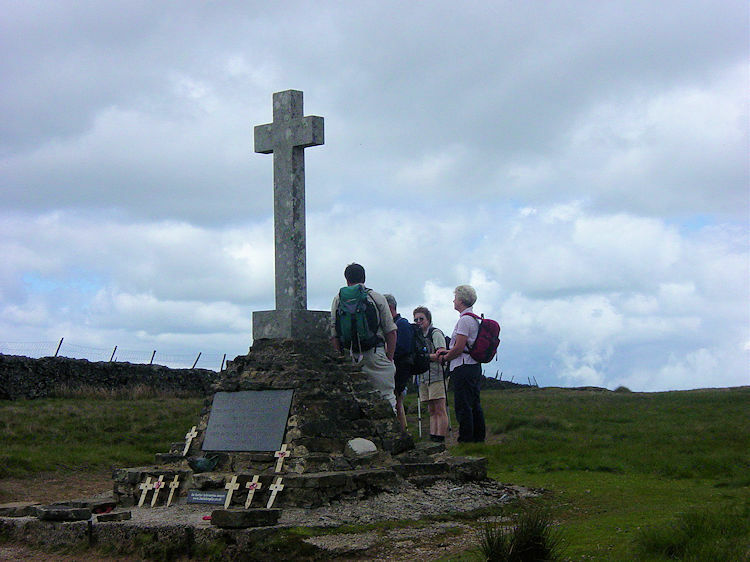 On Buckden Pike there is a memorial to the Polish crew of an RAF Wellington bomber that crashed on the moor during a snowstorm in November 1942. It must be visited for the story is inspiring as a sole survivor of the crash found his way off the moor to safety with the unlikely assistance of a fox. I will tell more about the story in the text of the walk. 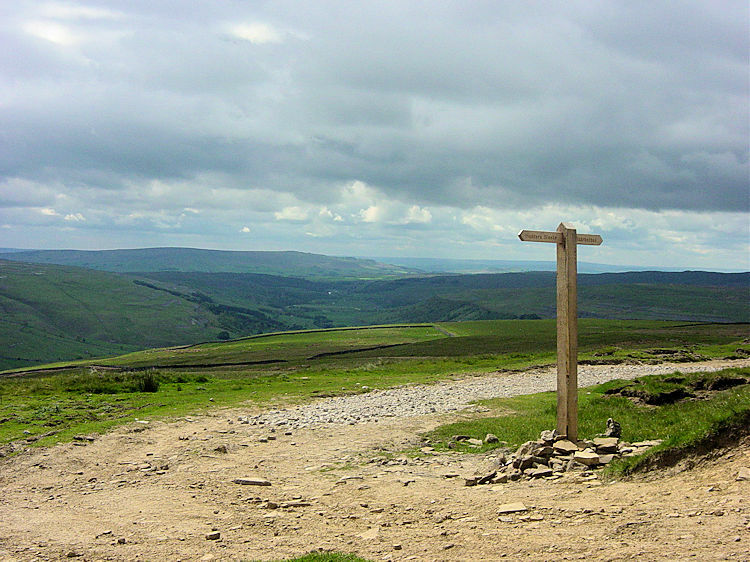 The walk itself is a classic dales journey from Kettlewell to the extensive upland range of Buckden Pike and then continues on across challenging moorland to Great Whernside. 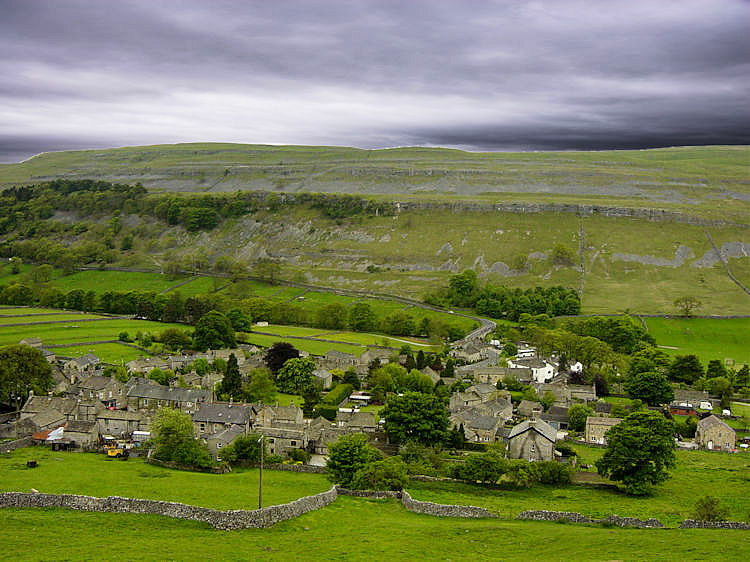 The views from Great Whernside and on the walk back to Kettlewell are well worth the effort. 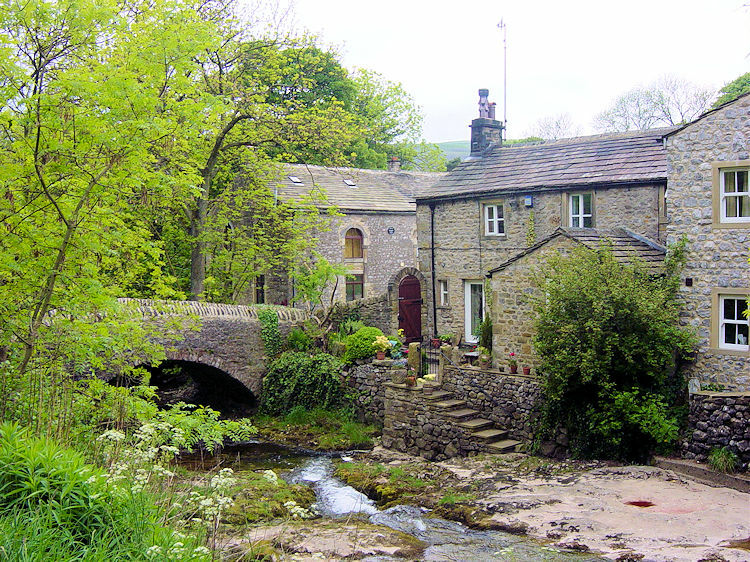 They are some of the best in the Yorkshire Dales. This is not a walk to consider lightly in the winter season or any time in spring before the ground firms up. 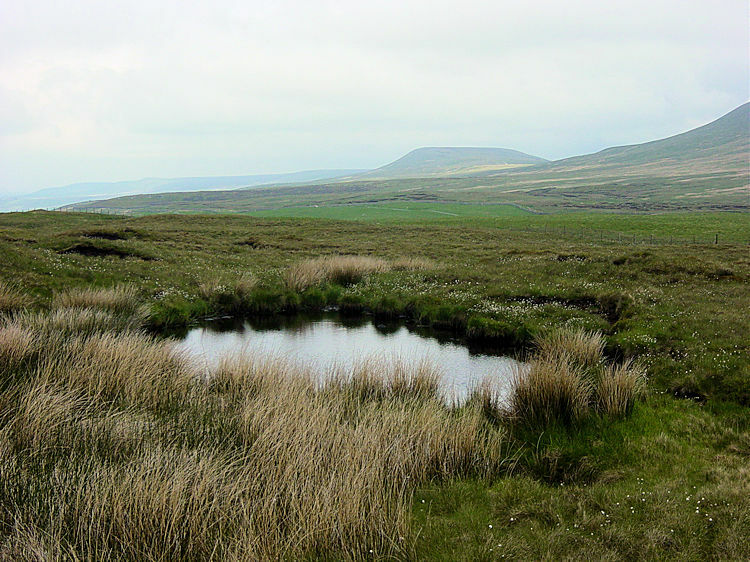 Buckden Pike has a great name and a tragic past but it is also a mountain that collects water and retains it most efficiently thus turning much of the high ground to bog. I have ventured up it on many occasions and got soaked up to my knees on most of them. It is also the only hill that has ever defeated me on a walk for during one winter expedition Dave, Steve and I came up to walk Buckden Pike and were caught out by a severe snowstorm. It drove us back down the hill as there was no way we could climb as the storm became worse. The snowstorm came without warning, having not been forecast. I wonder if that is what happened on the fateful day on 31 January 1942 when the Polish crew of the Wellington Bomber crashed on the hill. The story of the crash and the ordeal of the sole survivor Joseph Fusniak is a remarkable one. He wandered lost on the moor and only made it down because of the unlikely help of a fox. 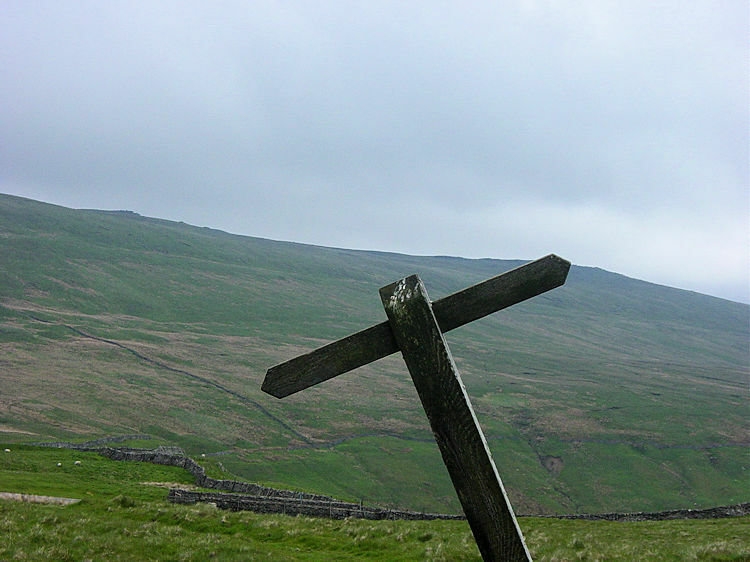 The whole story can be read on the Buckden Pike homepage. I recommend you go there and read about it. Back to the walk now and there was no chance of being caught out by the weather. The forecast was fine. It had been a remarkable Spring and the month of May 2004 was exceptional with no rain falling for a couple of weeks the ground was certainly drying well. In fact the local farmers were taking in their first silage cuts when I arrived in Kettlewell to start my walk. I began by leaving the village and walking due north to gain height on the Top Mere Road track. 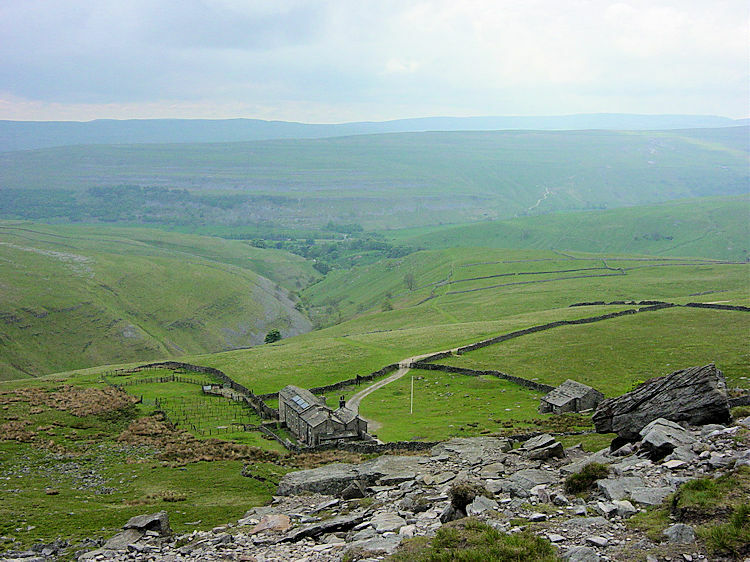 I soon was enjoying good views of the Upper Wharfedale valley and of Great Whernside, my final target. After less than an hour I reached the junction of Top Mere Road and Starbotton Road where I took a short break in the peaceful surroundings. After my break I cut off track for a short distance to track north until I met the Starbotton Out Moor track which led me along the western flank of Buckden Pike. 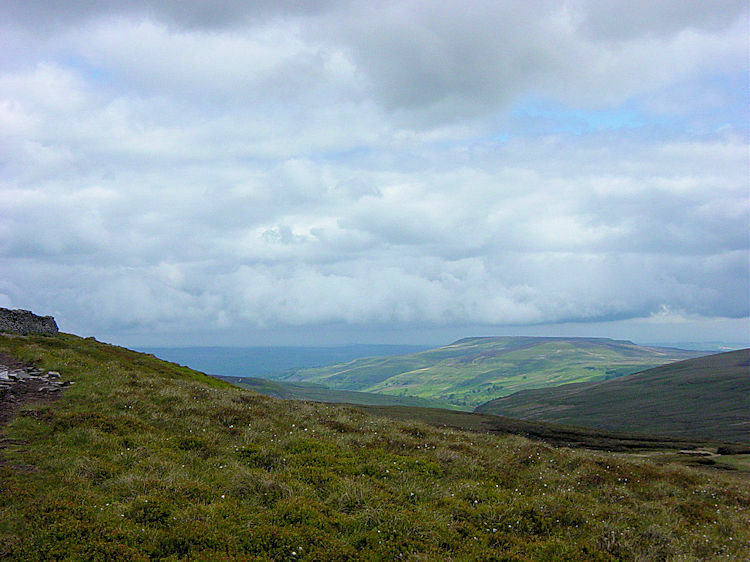 At the junction with Walden Road I turned west and reached the track that led me to the trig point on Buckden Pike. I did not stay at the trig point for my stopping point was the memorial about 100 metres due south from the trig on the way to Great Whernside. I reached the memorial and stopped. I read the inscription which reads 'Thanksgiving to God - The Parker Family and local people and in memory of five Polish RAF Airmen who died here 31/1/1942 buried in Newark - The Survivor' What hell it must have been for him. I imagined him struggling on the moor and as I paused for my break a group of walkers arrived to also pay their respects. This is a sad place but for me it is also inspiring for Joe did make it off the hill in the most remarkable of circumstances. I finished my break and left the memorial behind until the time of my next visit. I walked south and east keeping close to a wall which led me towards Tor Mere Top. This section is where the boggy ground is usually at its worse. Even with the recent good weather I expected to get a little wet but I was hardly splashed. The ground had really dried out and I passed Tor Mere Top dry. I continued on down from Tor Mere Top and reached the road crossing at Little Hunters Sleets without my boots getting sodden nor my trousers wet. I could not believe it. I walked from the road crossing down to a gill and took a deep breath. The next 20 minutes or so were going to be the toughest of my day and as I climbed alongside Tor Dyke and then steeply up the flank of Great Whernside. It is only a 200 metre climb but it is straight up and I took it in phases of 100 steps. Huff, puff, huff, puff pause. Then again and again and again. I finally reached a stile that would take me onto the final easy walk to the top. I was jiggered and rested at the stile until I got my breath back. Relieved as it was easy now I walked up the crest of the hill to the distinct shaped boulders of Blackfell Crags. 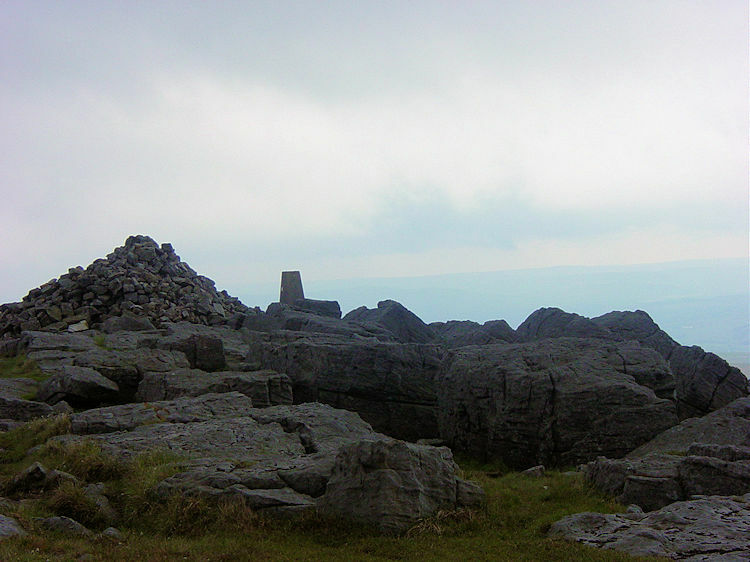 After walking amongst them I walked along the ridge to the trig point of Great Whernside. I took my final refreshment break in amongst the hidey hole rocks that litter the top of Great Whernside. 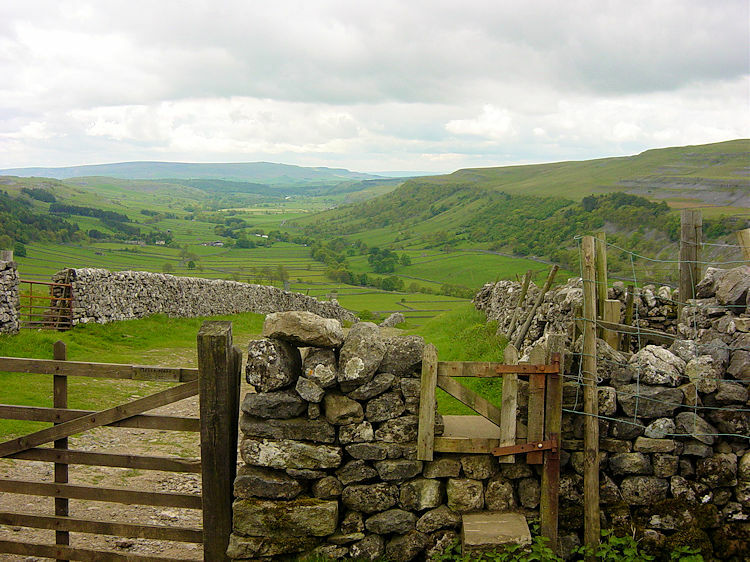 After my refreshments I moved off the top and started my descent back towards Kettlewell. 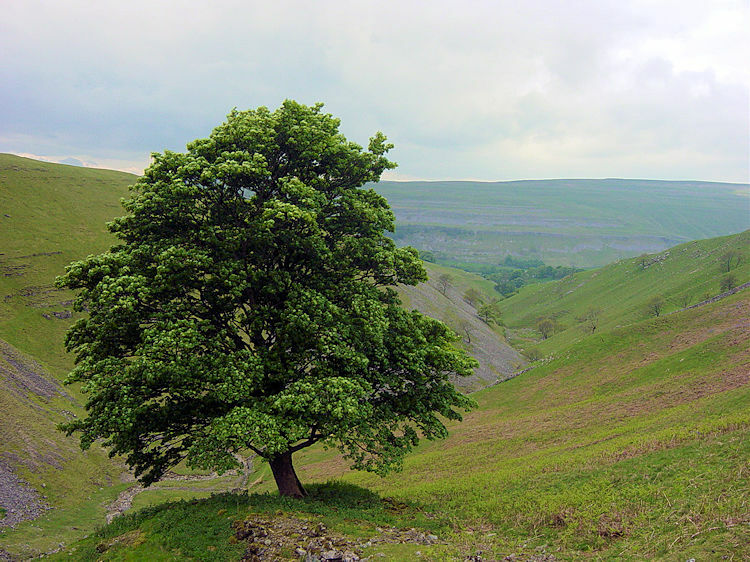 It is steep from the top all the way to the Hag Dyke Scout House but you can take your time for despite the tough descent the views on this section of the walk down the Dowber Gill valley to Kettlewell are superb. It would be a shame to miss out on them by rushing down the mountain and looking at where you are putting your feet all the time. After passing Hag Dyke Scout House I decided to drop down from the main track and explore the intricacies of Dowber Gill. I followed a path which at first was hardly discernible but which became a proper path quite quickly alongside the lovely little gill all the way back into the village of Kettlewell. 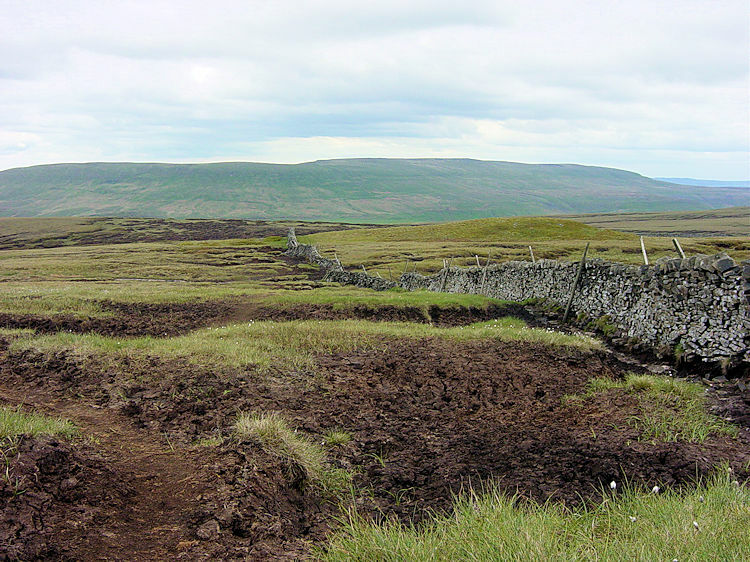 It was simply great to bound along this joyous little stretch of walking, a fitting finale to a fantastic day out walking in the Yorkshire Dales. All too soon my super day out walking came to an end. I was buzzing and I thought "where next?"